Accommodations with meals as indicated, luggage transfers as indicated, route notes and maps, local support 24/7. 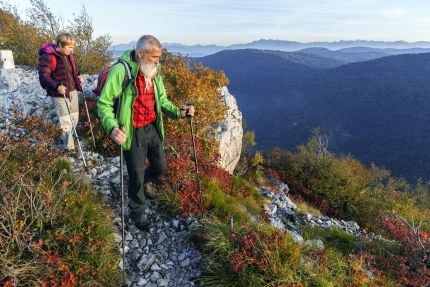 Slovenia is spectacular, yet by European standards, still quite undiscovered – truly a hiker’s dream. Our walking tour features the very the best of this uncrowded corner of Europe. This is a stunning hiking holiday in the heart of the Julian Alps and along its mountain ridges. This is a stunning mountain hike, taking you through breathtaking alpine scenery and its many attractions, including Lakes Bled & Bohinj. The tour is suitable for fit and experienced hikers. It requires some basic experience of walking at high mountain levels and narrow trails. Many visitors to Slovenia say they’ve never seen a more beautiful lake than Bled … that is, until they’ve seen Lake Bohinj. We hike in both regions. We take the time to discover the charming villages to the lake’s northeast, remarkably that have remained faithful to traditional occupations like dairy herding and farming. It is considered by most, to be one of the top countries in Europe that offers amazing value for your travel dollar. You will come home with a treasure box of memories!